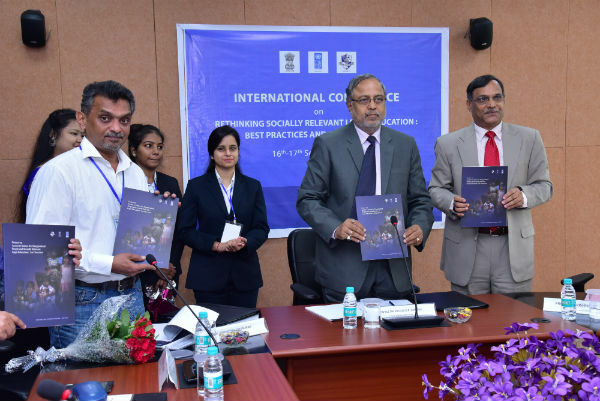 By Kamala Kanta Dash; Cuttack: An international conference on “Rethinking Socially Relevant Legal Education: Best Practices and a Way Forward” has been organised by National Law University Odisha (NLUO) in collaboration with Department of Justice, Government of India and UNDP. The two-day conference marks the conclusion of the three-year DoJ-GoI-UNDP sponsored project on “Access to Justice for Marginalised People and Socially Relevant Legal Education” which was being implemented by National Law University Odisha from 2014 to 2017. The Conference was inaugurated by Hon’ble Dr. Justice B.R. Sarangi, Judge, Orissa High Court in the presence of Prof. Krishnadas Sukumaran from Keele University, UK. Prof. Srikrishna Deva Rao, Vice-Chancellor, National Law University Odisha, Cuttack, Dr. Dolly Jabbal, Registrar, NLUO and Ms. Suman Dash Bhattamishra, Principal Coordinator of the project and Ms. Geetanjali Dhankar, Project Head of the UNDP project. In the inaugural session, a project report titled “Access to Justice for Marginalised People and Socially Relevant Legal Education: An Overview” was released by the Chief Guest, Hon’ble Dr. Justice B.R. Sarangi. Quoting Dr. Sarvepalli Radhakrishnan, Dr. Sarangi highlighted how nation building happens within the classrooms and not within the Parliament. He stressed upon the role of legal educators and how best they can be change agents and inspire the future legal professionals to work in the areas of advancing the cause of social justice. On Day-One, participants from India and abroad deliberated on various issues concerning clinical legal education and access to justice initiatives in India and elsewhere. The first session saw several points raised on how access to justice can be embedded into the broader legal education curriculum. Prof Sitharamam Kakarala of Azim Premji University, Nupur Sinha of Centre for Social Justice, Ahmedabad, Batool Qazi of National University, Maldives and Dr. Benarji Chakka of Symbiosis Law School and Siddharth Mohanty of Kalinga Kusum Foundation contributed to the discussion in the first session. Second session was focused on the community outreach through legal aid clinics. In this session Prof NK Chakrabarti of KIIT Law School, Prof MSK Prasad of Salgaocar College of Law, Goa were the chairs and co-chairs respectively. Dillip K Das, Hari Rout, Shahriar Sadat and Ramakrishna Das were discussants. Umi Daniel of Aide et Action South Asia and Meghamala Mukherjee of NLUO presented papers. The third and final session of the day delved deeper into the best practices and possibilities in web-based access to justice initiatives in India. Prof Krishnadas Sukumaran of Keele University, Dr. Anirban Chakraborty of National Law University, Nagpur and Prof AVN Rao of ICFAI Law School were chair and co-chairs of the session. Shameek Sen of NUJS and Dr. Ravindra Chingale, Advocate, Supreme Court of India were discussants. In the second day tomorrow there will be three important session focusing on i) Best Practices in Clinical Legal Education, ii) Developing a Model Curriculum for Clinical Legal Education and iii) Public Interest Litigation and Access to Justice. Renowned scholars like Colin Gonsalves, Senior Advocate, Supreme Court of India, Prof Kesava Rao, Vice Chancellor of Damodaram Sanjivayya National Law University (DSNLU) and Prof Venkata Rao, Vice Chancellor of National Law School of India University (NLSIU), Bangalore will join tomorrow to contribute to the discussions and reflections on the theme of socially relevant legal education. This Conference has been organised to deliberate upon what law schools have done so far to make legal education socially relevant and identifying what needs to be done in course of time to make a greater and more impressive impact.